Suffolk is proud of its rolling countryside and many Areas of Outstanding Natural Beauty - and YOU deserve to enjoy it on a break in a Country Hotel in Suffolk! Country Break Hotels in Suffolk are often impressive sights to behold but this doesn't mean you have to put up with draughty old windows and creaking floors as many offer you the height of luxury throughout your stay. Kesgrave Hall, Ipswich, has an exterior and interior that oozes with character and charm, yet generates a laid back atmosphere at every turn. It is open all day, as is its bistro restaurant, allowing you to arrive whenever you choose, and has picturesque grounds that the children can play in. It is also conveniently located on the edge of Ipswich close to the Suffolk coast so you can dip into Ipswich for the day, or head to the Coast. Check it out now! 'Grand' is a word that perfectly describes Hintlesham Hall Hotel, Ipswich. This Grade 1 Listed Elizabethan Manor House country hotel is in a league of its own. Found nestling in 175 acres of rolling Suffolk countryside, Hintlesham Hall provides exceptional dining plus many on-site facilities such as Health & Beauty and other specialist Spa treatments plus an associated championship size PGA golf course. If you fancy a more informal, home-away-from-home break, a Suffolk Inn in the country is a lovely and cost-effective option. The charming Westleton Crown, Westleton is perfect if you want to get away from it all. It has quietly cracking log fires and real ales with 25 comfortable bedrooms and is situated in the picturesque village of Westleton 2 miles from Dunwich and 8 miles from Southwold and Aldeburgh on the Suffolk Coast. 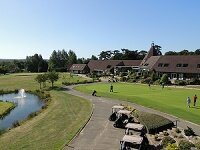 Also packed with activities is the Ufford Park Hotel, Golf & Spa. As its name suggests, there is lots here to entertain and relax you, plus it is perfectly situated in the close to the lovely town of Woodbridge so it is an ideal base for your Suffolk Country Break. After a long day out walking, cycling, bird watching or any other activity you have been enjoying in the Suffolk countryside, one of the best pleasures you can indulge in before hitting the hay is to enjoy a delicious meal in your Country Hotel. 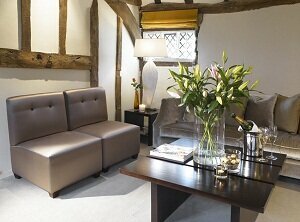 For a taste of some top French cuisine, The Great House in Lavenham is the perfect option. This 18th Century, boutique hotel also offers a pretty courtyard plus rooms with four-poster beds to ensure that your Country Break is as luxurious as possible. Tuddenham Mill, Tuddenham, is a lovingly converted water mill in an idyllic 12 acre rural setting near Newmarket and offers the ultimate in bedroom comforts and discreet yet attentive service. Have a wonderfully relaxing Countryside Break in Suffolk! Where's your favourite plac for a country break in Suffolk? Please let us know by sending us an email to suffolkguides.admin@suffolktouristguide.com.